Is it possible to spend too much time on your mobile phone? In today’s episode we will be discussing mobile phone addiction. Bilbilakee harkaarratti yeroo hedduu dabarsuun danda’amaa? Qophii har’aa keessatti waa’ee araada bilbila harkaa mari’anna. How often do you think typical mobile phone users touch their phones? Listen to Sam, Kee and Ammayyuu discussing the topic of ‘mobile phone addiction’ and find out the answer. Listen, then check the transcript below. Ashamaa! Gara English Together Afaan Ingilizii Walii Wajjiin mataduree tibbanaarratti mari’annuufi qooqa dubbachuuf si barbaachisu sii qoodnutti baga nagaan dhufte. Ani Ammayyuudha. Saam akkasumas Kii na waliin jiru. Kutaa qophii torbee kanaatiin waa’ee araada ‘addiction’ bilbila harkaa dubbachuuf jirra. Kana baruu waan barbaanneef fayyadamtoonni bilbila harkaa turtii hangamiitin bilbilasaanii akka deebisani tuttuqan hubachuuf murteessineerra. These results come from dscout.com. Ati maal yaadda? Yeroo hangam keessatti mobaayiliikee deebistee tuttuqxa? The question’s not for you. Itti dhiisi. Deebii isaa booda sitti himna. 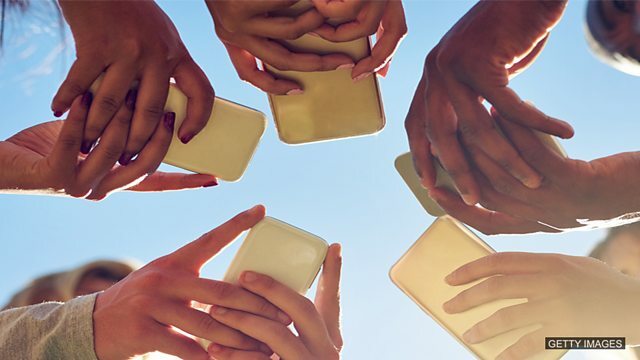 Now, listen to a BBC 5Live news story on this topic of mobile phone addiction. Araada mobaayilii harkaa fayyadamuu. Now, are you addicted to your mobile phone? Apparently, almost a third of us are unable to go more than an hour without checking it and a quarter of us recognise we are addicted to these devices. The heaviest smart phone users click, tap and swipe on their phone 5,500 times a day. Sorry… I’ll be with you in just a minute. Come on Sam, we are at work! Sorry, I got distracted there for a minute. <notification sound> Can you explain that while I answer this message? Saam! Sababiinsaa ‘distracted’ daran qalbii si fuudheeraa? Would you say that you can be distracted by mobile phones…? Sorry, I was distracted there, wasn’t I? Let’s get on with the show… so what do you think of this story? Well, it’s clear isn’t it – people just use their phones way too much. No one seems to be able to pay attention to anything anymore. I think you might be right - ‘pay attention’ jechuun qalbeeffadhu. But phones are just part of our life now, aren’t they? It’s complicated, isn’t it? I don’t think it’s that difficult – for some things you just need to be able to pay attention. What’s so difficult about that? Erm… Sorry again, that might have been me. Do people still turn their phones off? Really? All I have to do is make sure I focus on what I’m doing! Really Sam? Jechi ‘focus’ jedhu xiyyeeffannoo jechuudha. I have to put my phone away when I’m working on something, or I can’t focus. Guys, just turn your phones off, then you can focus. There’s no way you can be productive like this, checking your phones every 20 seconds! Yes, sorry! ‘Productive’ jechuun bu’aa kan buusu. I think I’m more productive when I really concentrate on work. Kun gara deebii gaaffii dura sigaafadhetti nu fida. Giddugaleessaan, ittifayyadamtoonni bilbila harkaa sekoondiiwwaan 33 keessatti deebi’anii bilbilasaanii xuxxuqu. And how do you think you could be more productive? Erm… by really focusing on my work. And what do you think would help you focus? I need to make sure I only pay attention to my work and not be distracted. Really? What do you think might be distracting you? You’re talking about my phone, aren’t you? Tole, Fakkeenyuma Saam nan hordofa jedheen yaada akkasumas bilbilakoo nan cufa. Atihoo? Bilbilakeetiin ‘distracted’ jeeqamtaa ? Wantotarratti akka qalbeeffattuu ‘pay attention’ akkasumas ‘focus’ hin xiyyeeffane si dhowwaa? Hojjiirratti ‘productive’ bu’aa qabeessa akka hintaane si taasisaa? Kan torbaan kanaa otoo hingoolabiin dura, waa’ee jechoota har’a dubbachaa turre haa ilaallu. Jechoonni hunduu fuulleffannaa waliin hidhata qabu. ‘Distracted’ jechuun hojii raawwachuu malturraa qalbeeffachuu dhabuu, ‘pay attention’ jechuun jeeqamuurra wanta tokkorratti hubannoo taasisuu; ‘focus’ wanta tokkorratti gadi fageenyaan xiyyeeffachuudha. Akkasumas, ‘productive’ jechuun turtii yeroo muraasa keessatti gara caalu hojiin dabarsuu danda’uuudha. Waan nu waliin turteef galatoomi. English Together Afaan Ingilizii Walii Wajjiin dabalataaf torban dhufu wal agarra. Gaariitti! To be ‘distracted’ is when you start to think about something different to what you are supposed to be thinking of. I burnt the dinner because I got distracted by the TV when I was cooking. I was trying to get some work done, but my colleagues kept distracting me with questions. To ‘pay attention’ to something is to concentrate on a particular thing. Pilots have to pay attention to all the instruments when landing a plane. If you aren’t going to pay attention in this class, you will have to leave! Sometimes I need to be somewhere quiet to focus on my work. I can’t draw very well unless I completely focus on it. ‘Productive’ means that you get a lot of work done in a set period of time. I am much more productive in the morning. I work much quicker then. I am more productive when I work with someone else – I get more done. Yoo jeeqamteetta ta’e wanta hojjachuun sirra hinturre yeroo hojjettu of agarta. Bu’aa buusuun hojii waliin wal qabata. So, what about you? Are you addicted to your phone? Do you know someone who is? What problems does this cause? What can people do to use their phones less? Tell us on our Facebook group. Join us for our next episode of English Together, when we will learn more useful language and practise your listening skills. Barnoota English Together ittaanu kan dandeettii caqasuukee ittiin shaakaltuufi qooqa barbaachisoo barannutti walitti deebina.